Dragonfly Necklace captures the mesmerising nature of the creature. Whenever we see one dancing in the sky, we stop to watch her, captured by her agility and elegance until she disappears. A glimpse of beauty in the Summer sky. Native Americans believe that the dragonfly is a sign of joy and purity. The dragonfly reminds one to keep a positive outlook no matter what. The magical creature’s short life is associated with this symbolism and prompts us to remember to live life to the fullest. A great sentiment. The Dragonfly also bears significant symbolism in other cultures. To the Japanese, it symbolises Summer and Autumn – admired and respected all over. So much appreciated that the Samurai use it as a symbol of power, agility and best of all, Victory. In China, people associate the dragonfly with fortune, harmony and luck. The Dragonfly Necklace is an excellent sentiment to both give as a gift and wear on a chain as a necklace or bracelet. This change can include a change in the perspective of self-realisation; a sense of mental and emotional maturity and consideration for the deeper meaning of life. Use the Dragonfly as a token to guide you through the mists of illusion and towards a pathway of transformation. With the dragonfly by your side, it will inspire and bring you light, colour, positivity and happiness into your life along the way. The magical iridescence of the dragonfly mirrors one’s ability to unmask the real self and remove any doubts o their sense of identity. Again indirectly means self-discovery and removal of inhibitions. 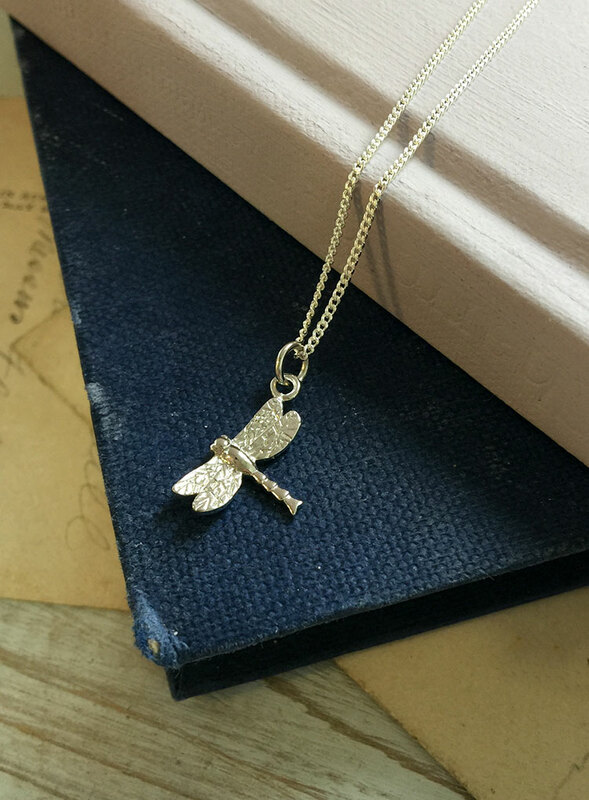 Dragonfly Necklace with pretty hand finished detail makes for the ideal gift for a friend, goddaughter, for any occasion. A gift of magic, elegance and grace.